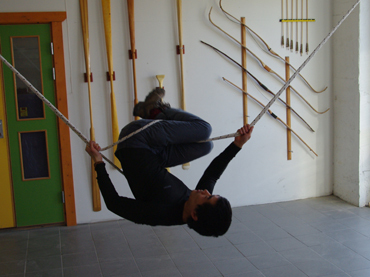 Allunaariaqattaarneq is the name of an age-old Greenlandic sport, and means something similar to "Game played with harpoon line". 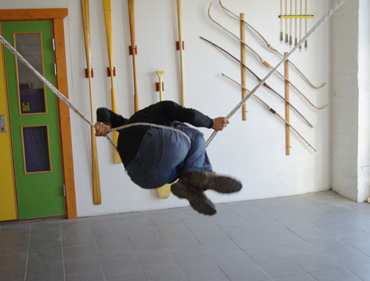 Long ago it was common to tie a harpoon line between two poles, and then twist around and do acrobatics on this. 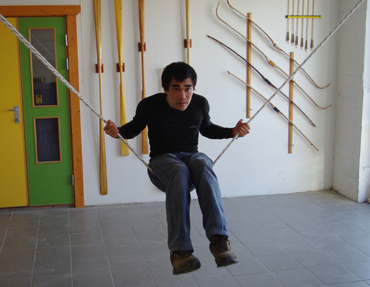 Today the sport is often called "Qajasaaneq" in the Western world. 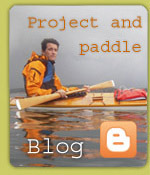 Its purpose was to train skill in movements similar to rolling a kayak. 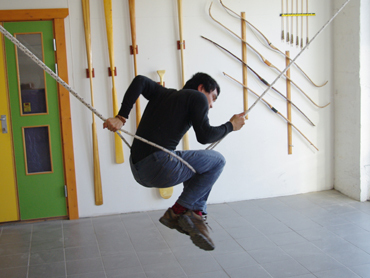 The game would also give the performer strength and agility, which was important for a professional kayaker. When we do rope games today it's mostly for fun. 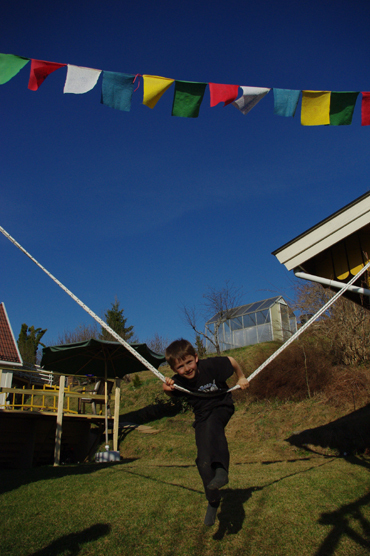 Our lives don't depend on a successful Eskimo roll, but it's certain that the rope game improves our proficiency in this, and it's both easy to master and fun to boot. 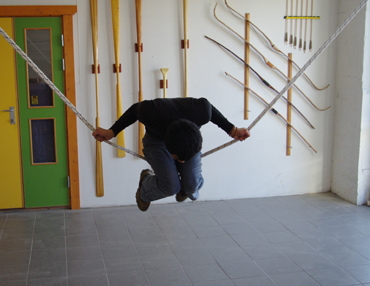 There are both high and low rope exercises. We'll cover some of the low ones here. Rope games require little accomodation. You just need a rope and two solid points to attach it to. You can do it inside or outside. Perfect for those who don't have access to a pool during the winter! The rope should be about 10 metres long. 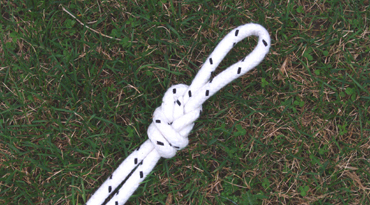 It should lie double (there and back), and the ends must be knotted, so that the two lines stay parallell and don't drift. A double figure-of-eight knot is good, as it can be loosened if necessary. 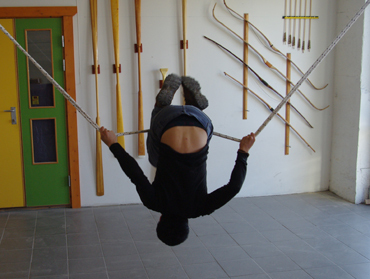 The rope should be suspended between two points about 4 metres away from one another. 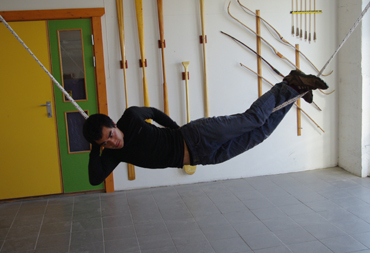 It should be at such a height that if you push the middle downwards until the rope is taut, the lowest point should be level with your navel. 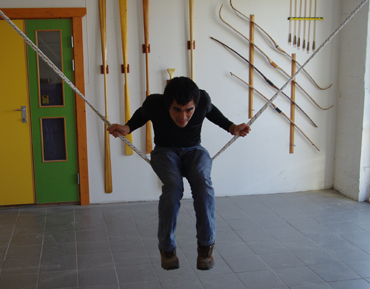 The rope should be fairly thick to avoid pain! 14-16 millimetres is fine. It should also be static, and if it's soft and comfortable to the touch, that's also good. 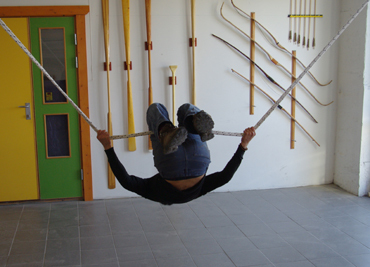 Appropriate rope can be bought at a fair price in the Kajakkspesialisten online store. 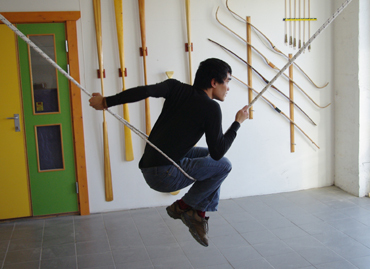 Ingilluni is a relatively simple and fun exercise. 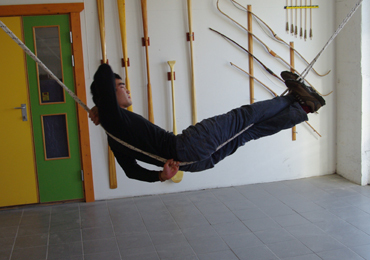 You sit on top of both ropes, so that the ropes are about halfway down your thighs. The ropes are bunched together. 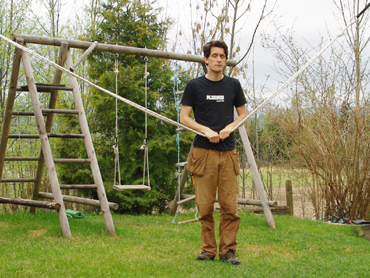 Grip the rope with both hands - palms forwards. Hold a bit out from your body. 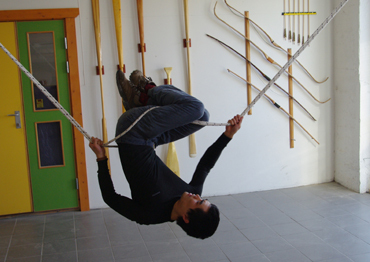 Now try to swing yourself around the rope, first forwards and later backwards. It may help to curl up a bit, and get some speed. Tunuussineq is more reminiscent of rolling a kayak. You lie on the ropes, which are together. Lock the rope between your feet and hold your feet tightly together during the whole exercise, with your heels under the rope. Hold your right hand around the rope behind your neck, and your left under the small of your back to keep the rope in place and centered there. 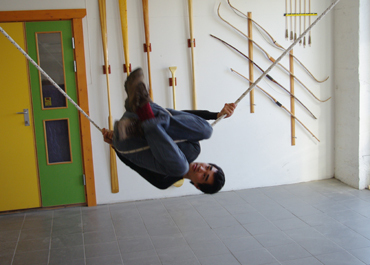 Now try to swing around the rope, first the one way, then the other. 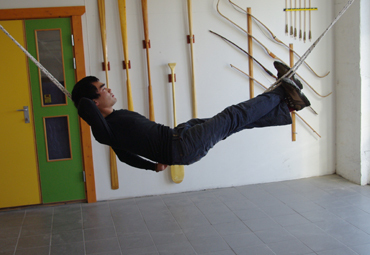 Qajasaaneq means something like "As rolling a kayak". 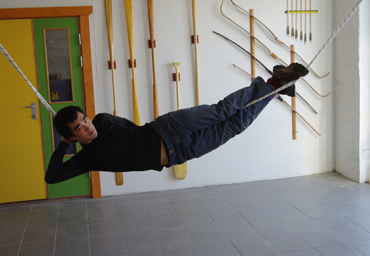 The exercise is very similar to a forward-leaning roll, or storm roll. It's one of the more advanced exercises. This time you sit between the ropes. One hand locks the ropes together behind you and the other locks the ropes together in front of you. It's helpful to place your bottom far down between the ropes, and curl into a ball. Your knees should be together and your ankles crossed. While in this position, turn over to one side, and try to gather speed to go around. 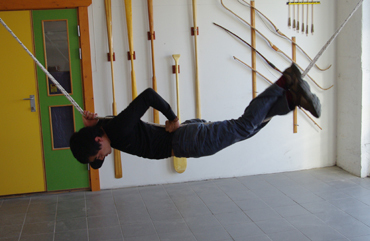 Your centre of gravity should be low, as when doing a proper forward-leaning kayak roll. This means you should bend your head down and try not to straighten out before you're "up" again. The exercise is done to both sides, and there are a lot of variations, such as picking up an item from the ground and rolling up, or rolling around 5 times in a row. Doing the exercise with a 10kg backpack on is another variation! There are lots of exercises and variations of exercises. It's fun, simple and inclusive for everyone. This is absolutely a sport for the whole family. Why not hang up a rope beside the swings and let the children try? They'll probably manage better than most adults, and it's always enjoyable! There are lots of resources available for anyone who wants to get started. At www.qajaqusa.org/Technique/Ropes.html there are some articles, video snippets and a PDF handout with exercises, which can be downloaded for free.